If you’re a budding blogger, having your own magazine style website is a dream come true. But don’t just throw in a bunch of snazzy photos. A well-crafted website not only draws in more eyeballs, it can be a good source of profit and joy, too. Here’s where having a consistent theme comes in. A good website theme helps tie elements together, and presents it to the online world in a beautiful package. Plus, it can save you time and money. Instead of slaving away for hours, just purchase a gorgeous theme that’s both pretty and functional. It does all the work for you! Want to tell your stories through fashion? Then this WordPress theme is for you. Created by Pixelgrade, it will highlight your content in the most practical way through slideshows, featured posts, and support for ads. 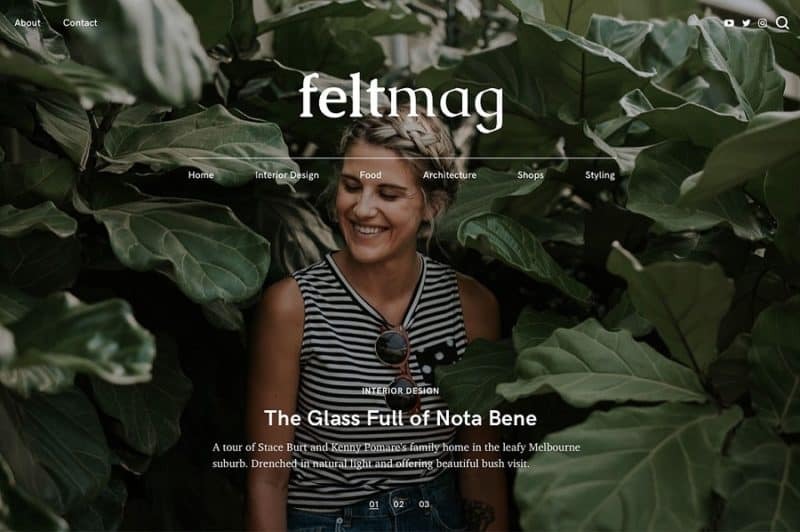 Beautiful, seamless magazine-style theme ideal for fashion, food, or lifestyle content. Especially created for publishers with plenty of stories to tell. Includes plug-and-play widget for ads and/or sponsored posts. Great for beginners and those who want to play around with content. A little on the pricey side; but makes up for it in terms of usable features. Homepage can feel a little crowded, especially if content has built up over time. This minimalist website theme in fact, comes in two variations (a one column OR two grid layout). Made by Just Good Themes, the simple magazine style is perfect if you want to display lots of captivating photos. Don’t be fooled by its straightforward look. After all, the best things don’t need a lot of trimmings. Theme comes in two styles (one column OR two grid layout) – with more features coming soon! Looks clean, minimalist, and simple. Theme is responsive – can be viewed across any device seamlessly. Ideal for photography, fashion, architecture, or other creative content. Supports popular plugins like Yoast and MailChimp. Could be too simplistic for some tastes. 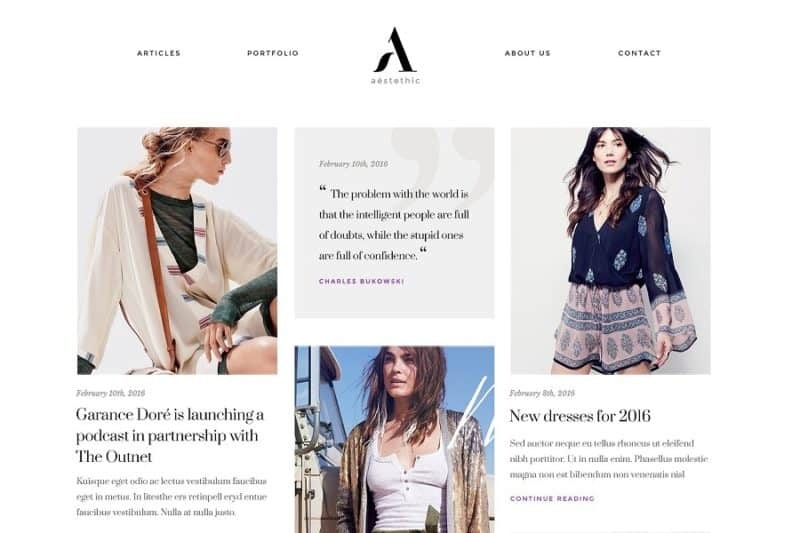 Created by Pixelgrade, this WordPress theme is chiefly designed with the future fashion blogger in mind. Stand out with this chic theme and get the world talking. Let website visitors easily share your works through accessible social media buttons. Plus, include your Instagram photos to update your followers on what’s new with you. Chic and effortless theme that looks stylish throughout. Crafted to increase social engagement with well-positioned social media buttons. Highly customizable theme; includes Smart Logo Creator so you can easily change the design to reveal your own style and tastes. May be a bit pricey for some folks. 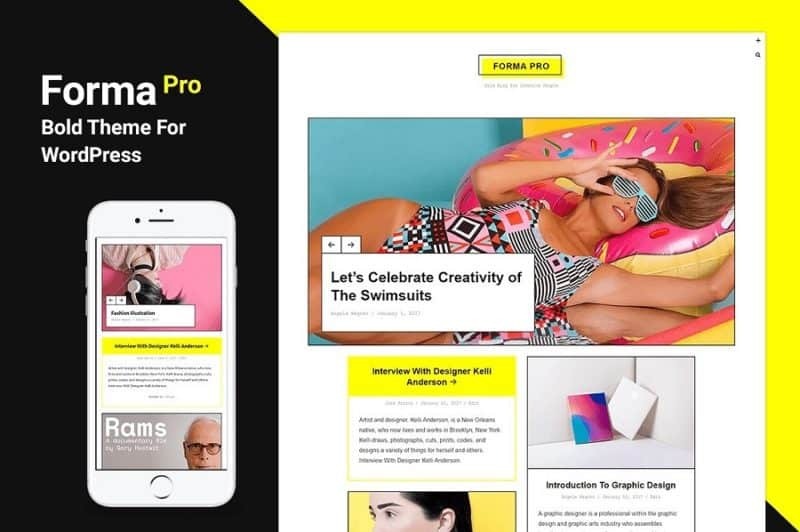 Make your website look AND feel like a world-class magazine in this beautiful WordPress theme by Basepixels. With four homepage styles, unlimited color schemes, and more than 800 fonts to choose from, you can spend hours customizing it to exactly suit your needs. Highly customizable; easily change color schemes, fonts, slider styles, and more! Ideal for fashion, travel, and lifestyle content. Purchase includes demo content and images. Mobile and SEO-ready for full performance and easy launch. Can look a bit crowded due to big font styles. Don’t just showcase your styles – sell them, too! 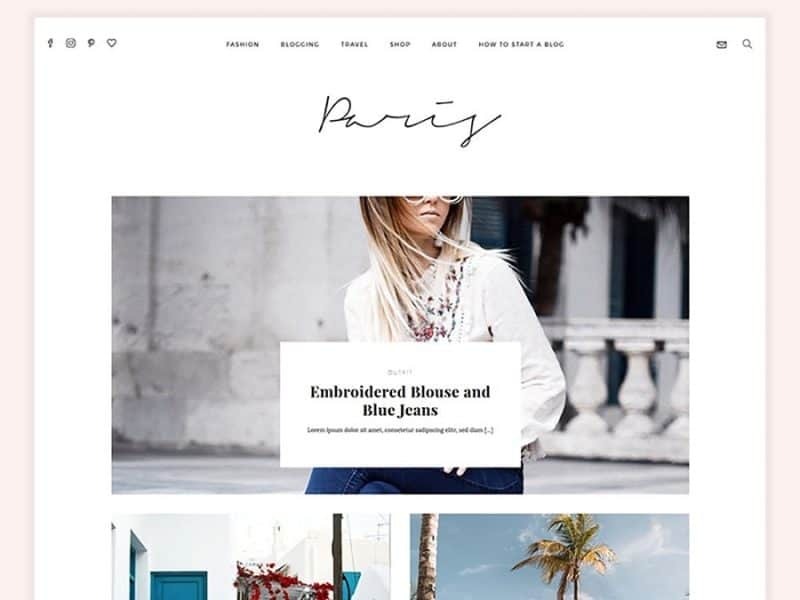 With this gorgeous WordPress theme from MunichParis Studio, now you can be a fashion blogger AND boutique owner. Thanks to their seamless design with built-in monetization shopping widgets, it’s never been easy to make good money with your awesome sense of style. **Hesitant or nervous about installing this theme on your own? Afraid that you might mess something up? Don’t worry: MunichParis Studio can do all the work for you! Simply purchase their WordPress Theme Installation Add-On and they will set everything up for you in no time. Great theme that looks effortlessly chic and elegant. Ideal for fashion and/or design content. Lets you get started on your own digital boutique with built-in affiliate shop features. Easily share content with fans, includes Instagram Feed Integration for more social engagement. 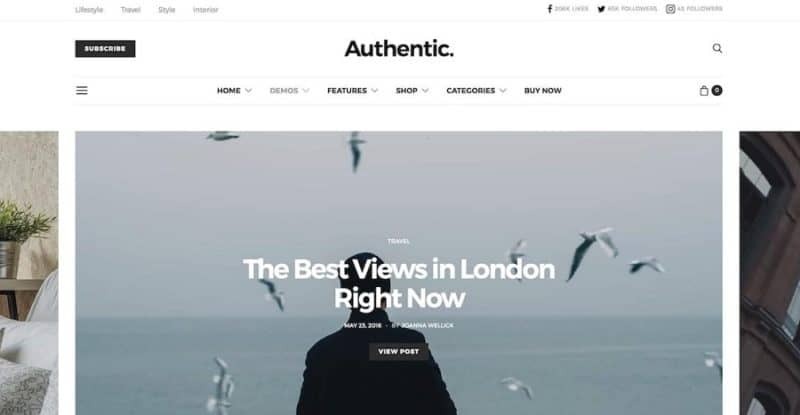 Theme is especially crafted for monetization, so it might not be suited to fashion bloggers who don’t want to sell anything, or are just into blogging as a hobby. 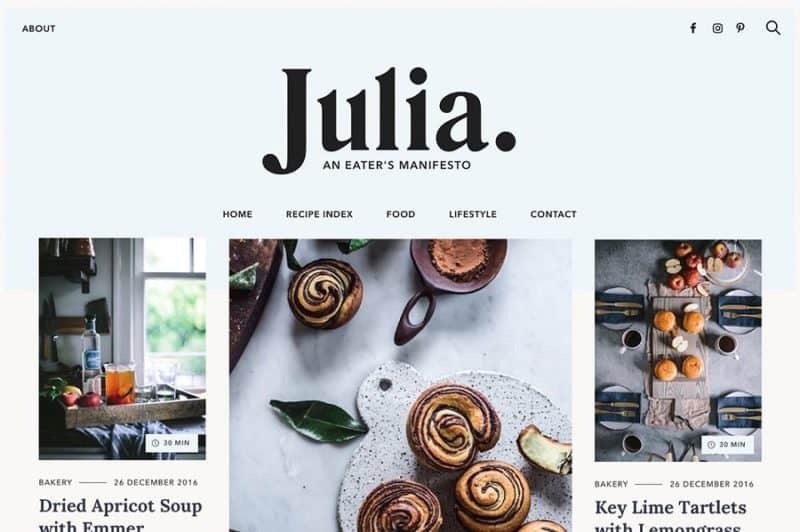 Share your love of food to the world in this beautiful website theme baked with love by Pixelgrade. Created with food lovers and home chefs in mind, their built-in Recipe Index allows you (and your readers) to effortlessly keep track of every recipe. This helps you focus more on your food adventures. Now all you need to do is share them with your eager community! Simple yet tasteful design that lets food and recipes shine! Contains built-in Recipe Index ton quickly keep track of recipes. Includes widgets for downloads, ads, and other future monetization plans. Optimized for SEO and mobile gadgets. Theme is designed and optimized for recipes, so it might not be suited for other content. Be ready to show off or sell off your fashion staples in this modern, minimalist theme by ThemeFuse. The clean, single column homepage looks great as a starting point for website visitors. From there, take them to your portfolio where you can showcase your best outfits. Got affiliates? Direct them to your shop where they can find recommended pieces from your closet. Minimalist, single column look is perfect for fashion, lifestyle, architecture, or any creative content. Includes Visual Page Builder to help you customize the look and feel of this theme with just a drop-and-drag. Auto installs demo elements so you get exactly what you see from the Live Demo. Contains WooCommerce and The Give plugins so you’re ready to start selling minutes after installation. Transitions or special effects might slow down loading speeds a bit. Are you the type who wants to change their blog as new seasons roll in? 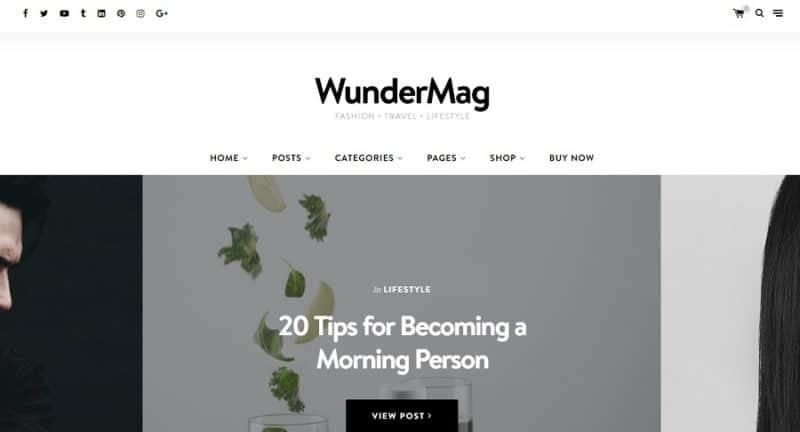 Then you’ll be glad to buy this lifestyle blog and magazine WordPress theme by codesupplyco. With nine different designs in one theme, you can create endless variations by just customizing colors, footer modules, headers, and more. 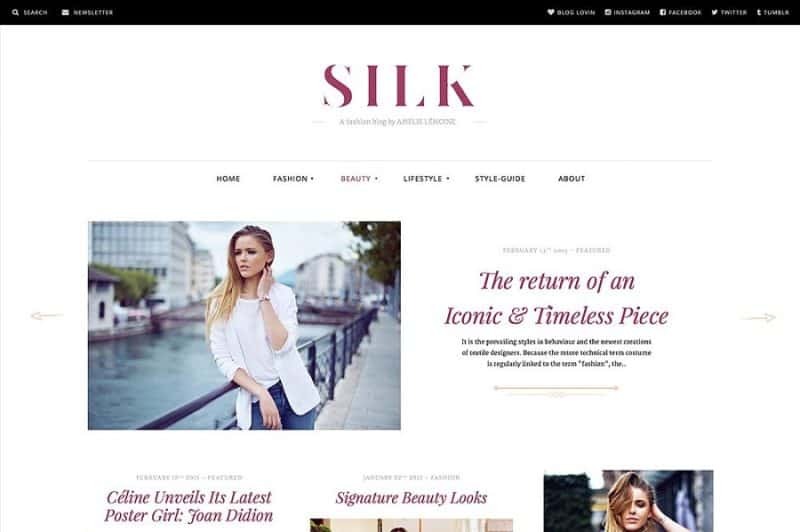 Immersive and highly customizable theme perfect for fashion, lifestyle, travel, design, or any creative niche. Built-in One Demo Switcher allows you to quickly switch between styles without worrying about existing content. Includes pre-defined color palettes, header options, four footer modules, Low Quality Image Placeholders (LQIP), and more! Option for parallax or video headers. None really, unless perhaps that you might be unfamiliar with some of the features. Don’t hesitate to contact their support team so they can help you get the best out of your purchase! 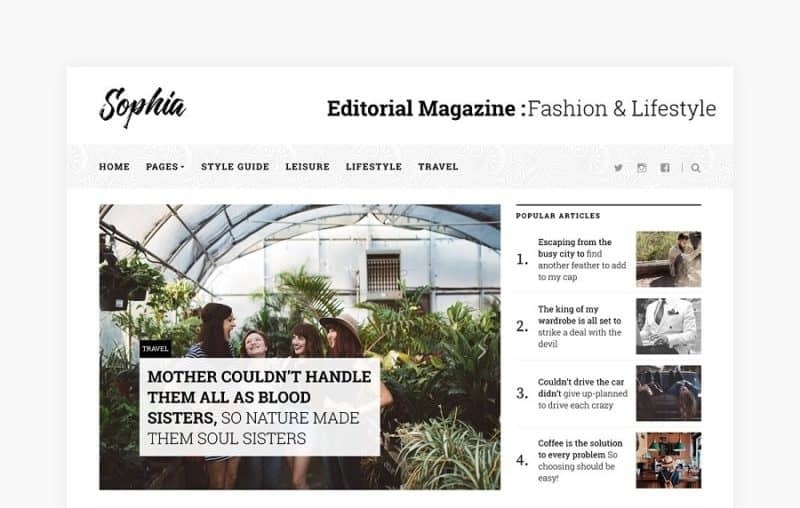 Created by fuelthemes, this lovely magazine-style theme helps you be the blogger you’ve always wanted to be. With five pre-made homepages, you can get a lifestyle blog up and running with no coding knowledge necessary. Change the design as you change your content! Fully decked-out theme with five pre-made homepages to choose from! Supports WooCommerce widget to help you start selling immediately. Different article layouts based on your type of content. Infinite Loading feature so guests can keep browsing your site with ease! Includes Visual Composer so you can drop-and-drag elements and have the site of your dreams ready in minutes. Depending on the style you choose, it can look like there’s a lot going on in the page. Tell your story that way that you want to with this captivating WordPress theme from VossenDesign. Created for creatives, this minimalist magazine-style theme is lightweight yet highly functional. Use it as your lifestyle blog and form your own community. Or take advantage of its built-in e-commerce widgets to start making a sale today. Includes 10 pre-made homepage styles, with a NEW infinite scroll feature. Customizable pages based on your content (video, gallery, audio, etc.). Grid or List view to make elements easy on the eyes. E-commerce ready with built-in WooCommerce and MailChimp widgets. SEO-optimized and mobile-ready for full performance. None really, except if you’re not fond of minimalist designs. Don’t forget to check out the Live Demos of these amazing website themes before you purchase. Once you decide on one, it’s all a matter of installation and customization. Buying a pre-made website theme can make all the difference. Not only did you save yourself some time, you’re also allocating all that effort into more creative pursuits.